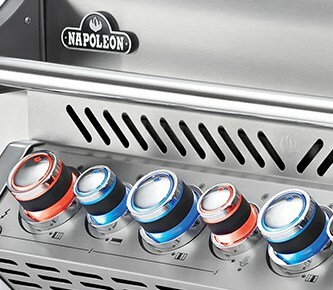 Napoleon’s Prestige PRO™825 with PSide Burner and Infrared Rear and Bottom Burners is beautiful and spacious, proving that two heads are better than one. On the outside, shining stainless steel body provides durability against even the harshest elements while chrome details add luxury. Night grilling is easy with the blue NIGHT LIGHT™ control knobs featuring SafetyGlow, which turns knobs red when gas is on. Never worry about accidentally leaving the gas on again. 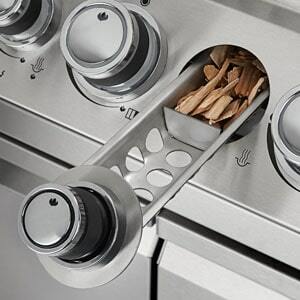 The SafetyGlow knobs have the added benefit of knowing which burners are lit, making it easier to get the perfect sear or the ideal indirect grilling spots. 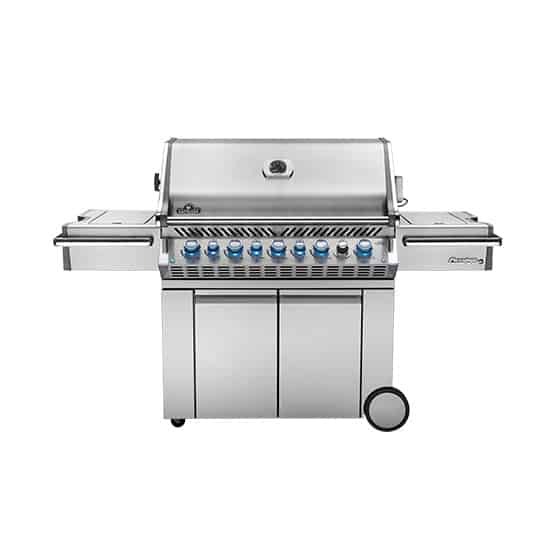 The large main grill head features enough space to grill for a crowd, while providing many different ways to cook. 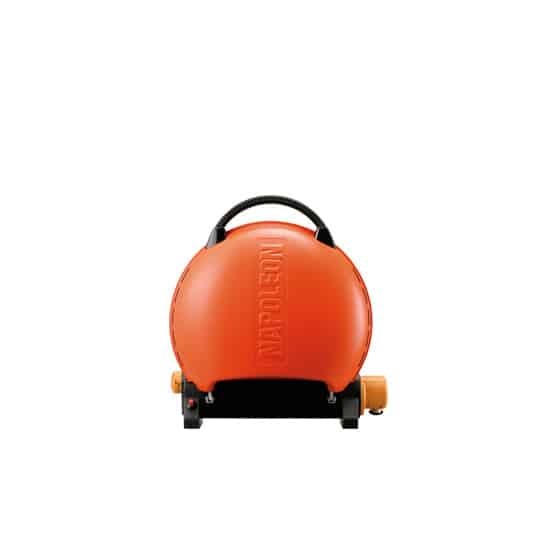 Sear over high heat, bake and roast using indirect heat, use the rear burner for rotisserie meals, and even turn your grill into a smoker with the integrated smoker tube and dedicated smoker burner. 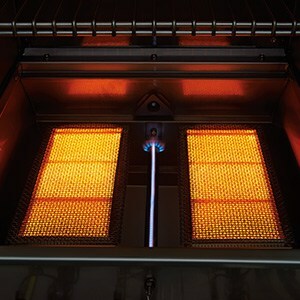 The secondary head features two ceramic infrared burners that reach high heat in seconds, ideal for searing restaurant quality steaks, or a quick meal for a couple of friends. The Prestige PRO™825 has a two-stage power side burner with a reversible cast iron cooking grid, ideal for sauces, sautés, side dishes and more. When reversed, the cooking grid turns into a cradle, perfect for a wok like our Stainless Steel Wok and making the best stir-fries. What isn’t in the box? 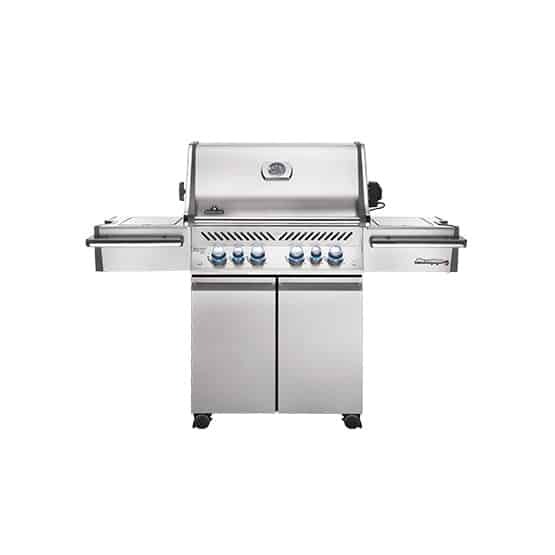 The Prestige PRO™825 with Side Burner and Infrared Rear and Bottom Burners comes pre-assembled with only minor finishing touches needed. The cabinet itself features soft-close cabinet doors, lighted interior storage, and ULTRA-GLIDE™ propane tank storage. 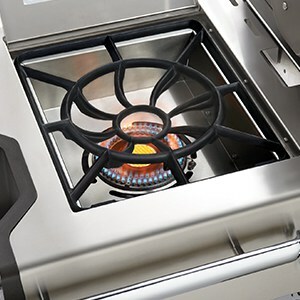 The side burner has a reversible cast iron cooking grid, while the grill itself has heavy duty, 9.5 mm stainless steel WAVE™ rod cooking grids. Get cooking fantastic meals right away with the included commercial quality rotisserie kit, or use the integrated smoking tray and dedicated burner. Keep things cool with the built-in marinade and ice bucket. We’ve thought of everything you need to get grilling like a PRO, even including an integrated power bar for the rotisserie and lights. 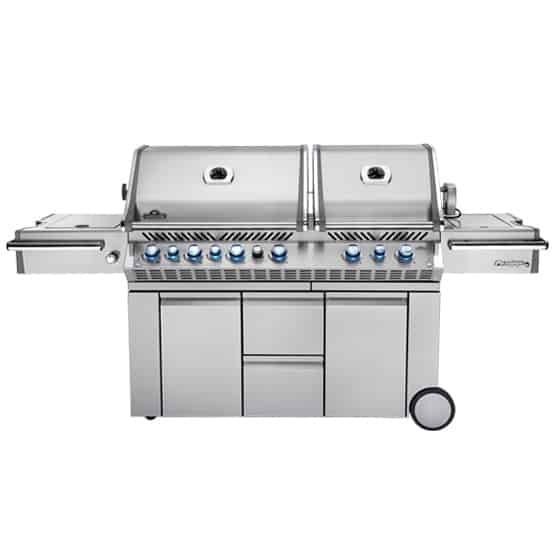 Napoleon’s Prestige PRO™825 is the epitome of cart style grills for the backyard grilling professional.